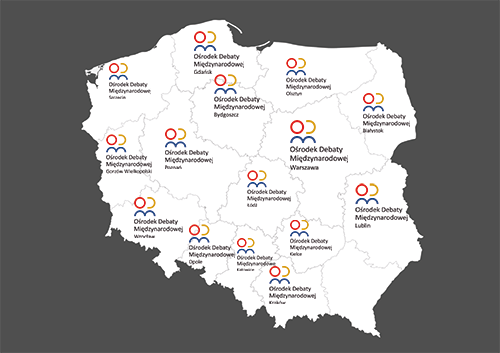 The Regional Centers for International Debate (RCID) function across the country with a mission to perform the role of informational centres about priorities of Polish foreign policy and the activity of the Ministry of Foreign Affairs. The RCID’s are also the primary channels of cooperation between the Ministry of Foreign Affairs, units of local authorities and non governmental organisations. The centers have been selected by the Ministry of Foreign Affairs as a result of the open competition and are responsible for initiation and animation of the meetings, debates and other events involving representatives of key institutions, organizations, and centres for research and analysis in regions. RCID’s are to organize the regional endeavors that engage the local experts and representatives of municipalities into discussion on functioning of Polish foreign policy at regional level, and the modes of local communities’ inclusion in building up the recognized position and positive image of Poland in the international arena. The Division of the Local Government and Civic Aspects of the Polish Foreign Policy in the Department of Public and Cultural Diplomacy is in charge of coordination the works of the RCID network within the Ministry of Foreign Affairs (contact: siec@msz.gov.pl).